Initially we are all interested in this new space for art, rather than the art itself. Naturally there is some very distracting art in the Switch House, but more of that another time, except to say that there is a wonderful amount of Louise Bourgeois, which is obviously a good thing. The Turbine Hall itself is still a thrill. 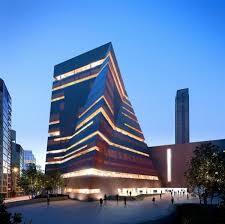 If you are a grown-up visiting Tate Modern and go in a side door rather than down the slope into the vast entrance, then you have grown up the wrong way, as the people have got so used to flying that they would rather waste their window seat reading the paper than experiencing the awe of the world spreading out below them, or passing through grey clouds to the sparkly azure side. Well, perhaps the Turbine Hall is not quite such an exhilarating phenomenon, but it is still a vast post-industrial wonder. Although not quite vast enough, as the new extension, the Switch House, indicates. The new building has a lot of needs to fulfil, to accommodate visitors to what is the most visited art museum anywhere, to make spaces to show work, and to provide a contemporary setting for art which can also evolve as culture moves on in time. 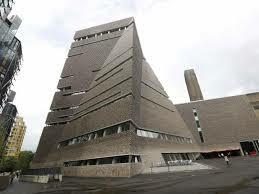 It also has to be something of an iconic structure, in sympathy with its surroundings and the older power station. It's a wonderful and welcome addition to what is becoming a very cluttered part of London - since TM came along, other blocks have sprung up next to it, offices and flats, oppressively crammed together, and often with odd angles jutting out. 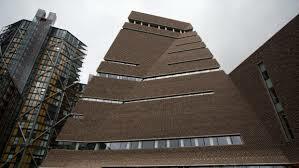 Architects Herzog & de Meuron have created a building which is exactly right for Britain and for London - it speaks of so many layers of history in its bricks, but is totally now in its twisty shape - a computer age monolith. Inside it's all about the view, at each level, and especially the top 10th floor where there is a balcony to walk completely around - this must be the best complete and free view of London - and the views are new, that slight different angle which allows for different aspects. Through the nearby blocks, the City looks a bit manic, those odd-shaped office blocks almost spilling out into the Thames. There are higher views, but this is a complete London from it's ancient epicentre. I think I could live on this floor, endlessly understanding the changing skies and weather. Views are not add-ons, the long banks of windows so integral to the structure both inside and out. And the interior is not exactly white-cube neutral, but a warm concrete with wooden floors that still smell of shavings. Visible metals echo the industrial heritage of the Turbine Hall side, and generous floors of gallery spaces look moveable to adapt for differently shaped exhibitions. Art-wise, Tate haven't fully moved in to this space as yet, but can surely now accommodate the streams of visitors that come. There are plenty of issues to discuss about Tate and the curatorial choices made, the choices of artists, the factory-warehouse industrial ethos, the way they describe and interpret, and so on. 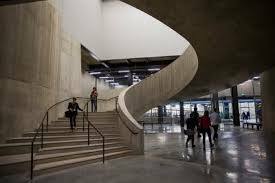 I think, however, that they missed a trick in the Switch House - the layout continues the endless conveyor belt approach of the Turbine Hall, an exhausting trawl through what is often an educational experience rather than one which allows the art to create its own atmosphere. 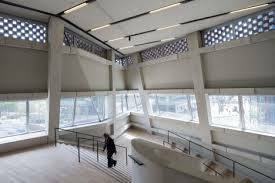 Tate are very aware that they are a public space, but to be a centre of discourse, where artists can arrange meetings, where tutors and mentors can conduct classes, where artists and others come to work, write and think, there ought to be many more places with tables and chairs available. Not just cafes, the odd bench, or the members room, but places where people can stay for hours, being creative, being productive, without being shuffled on, endlessly directed and curated.